This job came in before the Morgan Stanley (MS) job. Thus, I have to finished it on time, even though the MS job was not finished yet. "we would like the two characters to sit on top of the piano holding hands facing the front. The bride will also hold a bouquet on the other hand. Hope this can be done. Another thing is for the wording part. I think we will do some simplication. We just want the following chinese characters 共结莲李 and date of wedding 12月6日 at the bottom and at the top of the portrait will be our names as seen from attached (our names on top of portrait):李勇辉 陈秋莲 . 1) Can we have the 5 musical lines on these wordings ? If it is not nice, can we have some musical notes around the characters if it is appriopriate ? 2) These wordings need not be too big which might "destroy" the drawing, just of appropriate size. 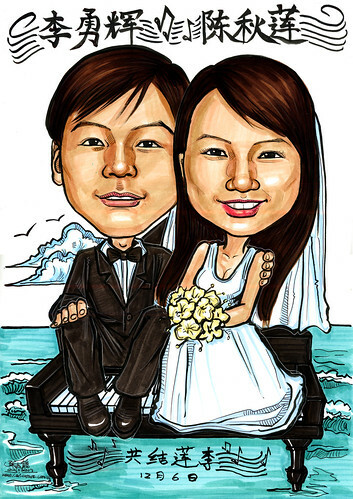 Beneath the piano is the seawaters...."
After discussing with the client, the above brief was the revised version, as his initial brief was not really workable or won't turn out nice, in this hand-drawn caricatures. It would be possible if all these were done digitally. However, he can't provide high resolution of those logo and fonts he requested for.